I think my generation was one of the first to have been told that little girls could be anything they wanted to be. You can become an astronaut; they assured me. Although, my crippling fear of heights and average performance in math and science stood in my way. You can become an artist like Picasso! If unintentional likeness to Picasso’s paintings would’ve made me money, perhaps I would’ve chosen that route. Even Barbie encouraged us to think big with our careers; whenever she had a new career, my dreams changed. I think there was a time when I sincerely wanted to be a veterinarian, just because Mattel gave Barbie the cutest dog and cat accessories that I had ever seen. Becoming a full-time, stay-at-home-mother was never a part of this initiative. At least, that was the message I got. Progressive women had to keep full-time motherhood as a choice (to be fair), but never actually celebrated this decision as a career choice. After all, raising children is not a career path; it is simply a small part of “having it all.” Staying at home with your children was a calculated pause in your dreams. Maybe I misheard, but I never sensed that motherhood was the apex of career success. It comes as no surprise that with the advent of the encouragement for women to “do-it-all” and “have-it-all,” I have felt the sharp sting of insecurity in my decision to stay at home and raise my little boy. Neither did I. I fought hard for my position at one of the best schools in the state. I wanted that job so badly that I worked long hours to make sure I had a long-term position within the walls of the high school. I had never worked so hard for something in my entire life. I loved being a part of something bigger than myself. I loved being able to build relationships with the students and staff. I could truly say that I loved teaching 90% of the time. The other 10% I just liked it. I was happy in my career. I was so new to the profession and I was so excited about what I had left to learn. And then I had the most perfect little baby boy; life as I knew it began to change. I fell in love when I saw him. I spent each of my days on maternity leave soaking up each moment. I took deep breaths in and closed my eyes. I was afraid I would’ve missed something if I didn’t take time to capture the moments with a visual snapshot. I held that little life in my arms and looked at each of his smiles and my heart broke at the thought of leaving him in someone else’s care. I knew that I had never gotten a more important role in my life. I knew that, no matter what, I didn’t want to miss a minute with him. The long days were exactly what I wanted. Met with plenty of tears and long conversations with my husband was the toughest decision of my life. Saying goodbye to my job was not easy. It still isn’t easy. Truth be told, on some days, I miss it. I miss strange things like my drive to work; drinking coffee and listening to my morning radio show. I miss getting dressed up and saying hello and smiling at everyone. I miss being able to hug my students every day. I also miss the security that comes with stating that I teach for a living; without disapproving glances from those who don’t respect moms who stay at home with their children. And I meant it. Yet, the insecurities are real. Being a stay-at-home-mom has given me the greatest lesson in contentment I have ever learned. And lessons, as it turns out, are not always easy to learn. I’ve learned this lesson of contentment so many times in so many seasons of life: unemployment, singleness, or general uncertainty. And yet, as different as each season looks, the message remains the same. If I continuously look outside of my circumstances, I will never be happy. 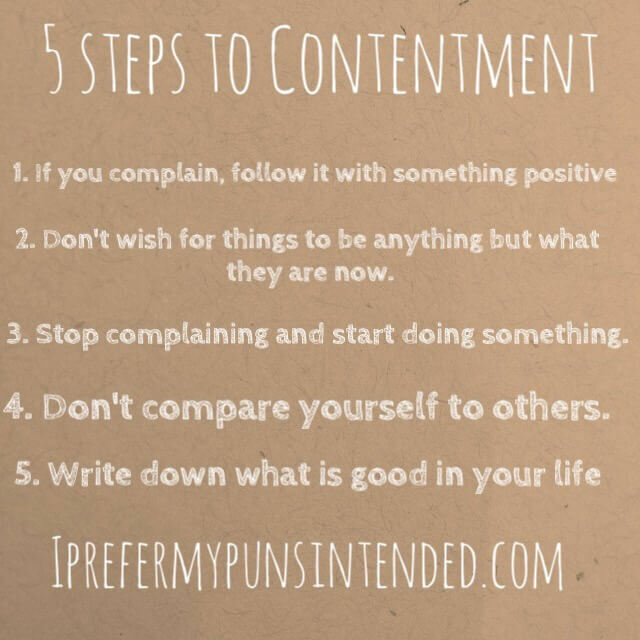 Here is what I know to be true in my experience to find contentment no matter the circumstance. 1. If you complain (even once), follow it up with something positive. I could easily say, “don’t allow yourself to complain.” The follow-through is the toughest part. In my experience, airing your complaints is healthier than keeping them in, but in the same breath, you have to follow it up with a positive. Also, don’t be a broken record. Once you’ve aired said complaint, you cannot keep complaining about the same thing. Don’t allow yourself to be completely negative; if anything, remain neutral. In my experience, the more I allowed myself to see the positives, the happier I was. After a while, I stopped seeing the negative in my situation and focused on the positive. Change is difficult. Let yourself feel the weight of that change, but celebrate what is good about said change. 2. Don’t wish for things to be anything but what they are now. When I was transferred from one school to a different school within the district, this was tantamount for me to change my attitude. I couldn’t wish for my lot to be different; I was determined to see my world the way that it was. It was about a month into my new position when I realized that I was still doing what I loved. And I would celebrate the fact that I got to teach every single day, rather than wish I could teach somewhere else. Something funny happened; I started to genuinely love my new school. I loved the opportunities I had within the walls of my new school. Sometimes, contentment has more to do with your attitude than your circumstances. 3. Stop complaining and start doing something. If you can’t change something, stop complaining about it. If you can change something, make a plan to change it. When I was unemployed for longer than I’d like to admit, I stopped lamenting my unemployment, wrote out my goals, and wrote out steps to achieve my goals. Making logical, achievable goals changed my life. 4. Don’t compare yourself to others. This is huge for me. I learn this every single day in lots of different ways. Parenting has given me a whole new perspective on how comparison robs one of their joy and purpose. Celebrate what is good in your life; celebrate what is good in others’ lives; don’t allow yourself to envy. 5. Write down what is GOOD in your life. This really helps me. ANY time I feel the urge to take a trip to negative town, I journal about what is good in my life. And as far as I am concerned, I am living my dream of raising my little one. Take that Veterinarian Barbie. Hi Mrs. Carrington! I just wanted to say that I’ve been following your blog lately and I love reading everything you post; you always have something insightful or just something that brightens my day (Bennett is absolutely adorable!). I especially love this post, because it applies to my life so much right now. This year has really been a big transition for me (my stress load has grown exponentially) and I don’t think I really stop enough to just enjoy and appreciate everything in my life the way it is at this moment. This was so helpful, thank you! And even though I miss you and your class, I’m so happy that you’re happy right now! I know that it must have been incredibly hard to make the decision to be a stay-at-home mom, but I can tell that it was definitely the right choice. I hope you and your family are well, and Merry Almost-Christmas!